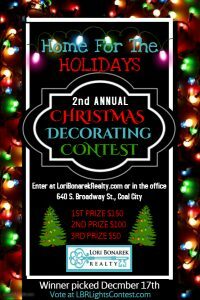 Lori Bonarek Realty is happy to sponsor our holiday decorating contest for a 2nd annual year. You may REGISTER HERE if you would like your house to be eligible in our FREE contest. You may also fill out a paper registration at our office (640 S. Broadway St., Coal City). We have prizes for first ($150), second ($100), and third place ($50). New this year: instead of only a committee of voters, voting will be open to the public! Starting December 3rd, you can vote for your favorites at LBRHomeForTheHolidays.com! Fine print: By registering you give the Home for the Holidays decorating contest permission to take and post pictures of your home on websites, including Facebook, for promotional purposes and also allow a sign to be placed in your yard for voting purposes. Registration is FREE but all homes must be within Coal City school district boundaries.